Willa Stevenson Eastlick’s wedding quilt, created in 1904. Wilhelmina (Willa) Celeste Stevenson married John Jacob Eastlick on June 4, 1904, in a ceremony held at the Methodist Protestant Church in Seattle. The Reverend T. S. Winey officiated, and May Eastlick and S. J. Beresford were the witnesses. Both the bride and groom came from families living in Issaquah, and they would make their home there, at times living with Willa’s parents. One of their wedding gifts was a quilt (2016.17.66) that had been made by a group of their family and friends. Such wedding quilts were part of the overall tradition of friendship quilts, which were common throughout the nineteenth century in the United States. 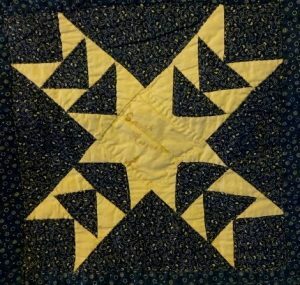 In a society where commercially produced cloth was readily available and sewing skills were near universal among women (and not unknown among men), putting a quilt together was an easy group activity. Friendship quilts were made for several reasons. They usually were meant for a specific individual or couple, either marking an event or as a farewell. Couples or families moving West were often given one by the friends and family they were leaving behind. 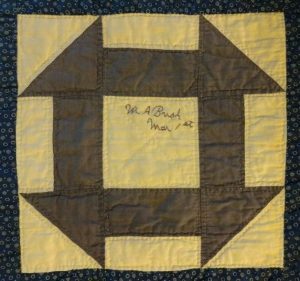 Community groups made quilts to send to soldiers from their towns during the Civil War, providing both the morale boost of personal support and practical warmth in an era of minimal standard issue supplies. 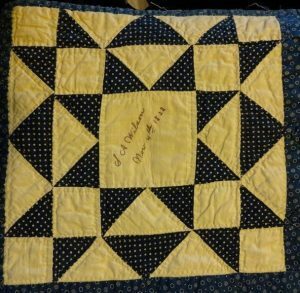 Likewise, quilts were donated to the general war effort or were raffled to raise money for other supplies (especially for medical needs). If you were about to set up housekeeping, you would need bedding. People who wanted to celebrate your wedding could work together to provide a key piece that also expressed suitable sentiment. The quilt shows coordination and careful workmanship. Someone set the theme of only blue and white squares and determined what size they should be. Probably a woman, and maybe even Lucy Stevenson, the bride’s mother, was in charge of the project. Lucy, a professional milliner and seamstress with her own shop in Issaquah, had all the skills necessary to plan and execute a quilt, with or without help. We have other examples of her quilt work in the Lucy Stevenson Collection. Artifact number 2016.17.62a-e is a set of doll bedding, complete with two small quilts, and 2016.17.59 is a sample of her crazy quilt work that has been framed. Quilting was part of Lucy’s life; she even owned a lap table (2016.17.57a-f) specifically designed for quilting from the comfort of an arm chair. Forty-seven people contributed one square each, and a single blank square was used to even out the final row. All but two of the squares adhere to the blue and white color scheme. The two odd ones, made by the Sylvester sisters, are both in pale off-white shades. Each square is different, and all but the blank bear either a name or initials in embroidery or ink. Most also have at least part of a date, and those correspond, in so far as can be documented, with the makers’ birthdays. 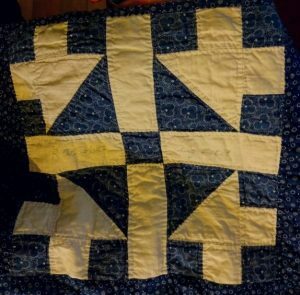 Once the squares were collected, they were sewn together, in this case with blue sashing in between. The completed top was then layered with a batting and a backing, with binding all around the edges. The binding matches the sashing. The backing is white, and the hand quilting is in white thread. The quilt is well made and has worn well. The turned edges of the binding have cracked on the fold, and there is some minor staining, which leads to the conclusion that the quilt has been used but not abused. It has a hanging sleeve of white cotton sewn at the top of the reverse; this was done while it was exhibited as part of in the collections of Washington State University in the early twenty-first century. The quilt documents the social ties of the couple at the time of their marriage. Willa’s and J.J.’s close family members contributed squares, as did Issaquah area friends, and people Willa’s family had known in Kansas. On this quilt, all of the contributors who can be fully identified are women or girls. Lucy A. Stevenson March 9, 1840 — Willa’s mother, who was born Louisa Ann Whitehead. Lucy’s childhood was spent in Pennsylvania, where she apprenticed with a milliner. She moved to Kansas, probably with her widowed mother and some of her brothers and sisters. There she married DePue Miller, who also had business and family ties back to Pennsylvania. Their marriage was recorded in Geary County, Kansas, in 1866, and they made their home in Randolph, Riley County. DePue speculated in land and had financial and legal problems. Lucy ran a millinery business and gave birth to a son, Howard. Nine years later, in May of 1875, DePue died, leaving Lucy with debts and legal problems. Things got worse. Her only sister, Georgeanne, who lived with her or nearby, died in July of that year. In the midst of this sorrowful time, James Stevenson, who was driving cattle, stopped at Lucy’s rural home to ask for the use of a map. She made an impression on him, and he wrote to her the following year to reintroduce himself. He was one of three suitors of the Widow Miller. He married her on August 20, 1876, in Riley County, and Wilhelmina was born almost exactly nine months later. At some point between 1890 and 1893, the Stevenson family picked up stakes and moved on to La Veta, Colorado, where they lived long enough to be involved in the local Masonic lodge and to order fruit trees for planting. By 1900 they had moved to Issaquah, where Lucy, James, Howard Miller, and Wilhelmina would all live out their lives. C. Whitehead February 22, 1820 – Lucy Stevenson’s mother, Willa’s grandmother, Caroline Berry Whitehead. Originally from Pennsylvania, where her children were born, Caroline had been widowed and moved to Kansas with several of her grown children by 1870. In the 1890s she was living with one of her sons and his wife in Chicago, Illinois. 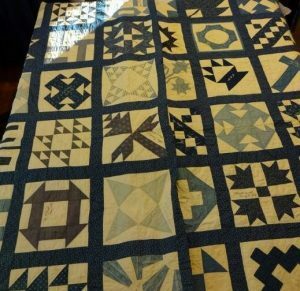 In the winter of 1894, a family letter reported that she had “. . .been making crazy quilts this winter[;] we have pieced 3 silk quilts and 1 plush and velvet one.” (2016.17.259c) By 1900 she had moved to San Francisco and taken up residence with the family of another son, Samuel B. Whitehead. She lived with them until her death, at the age of 95, in 1915. Ella Stevenson 1862, August 16 – Willa’s aunt, she was married to George Washington Stevenson (known as “Wash”), who was James Stevenson’s brother. Although the Stevenson brothers had started life in Ohio, George had also made his way to Kansas. He and his family remained there, even as James and Lucy moved west. Both the 1900 and 1910 census show Ella and Wash and their children (and her mother) living in Green, Pottawatomie County, Kansas. Juanita Stevenson December [15?] 1901 – Willa’s cousin, daughter of Ella and Wash Stevenson. 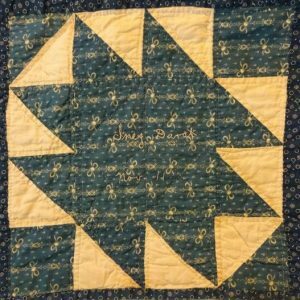 Her mother probably made this square so that her two-year-old daughter would join the other women of the family on the quilt. Abbie Eastlick December 1, 1853 – The groom’s mother was born Abigail Alice Vaughan. Her parents were John William Vaughan and Rachel Mercer, of the Mercer family so key to Seattle area history. Her husband was Mahlon D. Eastlick. The Vaughans and the Eastlicks took up residence, farming and owning a successful mill, on the part of the Issaquah Plateau known as Vaughan Hill. Abbie and Mahlon named their firstborn son John Jacob, after his grandfathers, John Vaughan and Jacob Eastlick. Three out of J.J.’s five sisters signed their squares with their initials and birthdays. The other two sisters were the youngest, aged 14 and 12, and they are not represented on the quilt. N. E. August 24 – Nell Eastlick was born on this date in 1879, in California. She married Carl Frederick Gronlund in Seattle just two months after J.J. and Willa’s wedding. M.E. October 11 – Mary Edna Eastlick, J.J.’s sister born in 1883 on this day. Information about Wilhelmina’s family members is drawn from legal documents available on Ancestry.com and from the letters that are part of Accession 2016.17, the Lucy Stevenson Collection. By the time Willa and J.J. married, people had been moving into the Squak Valley from other parts of the United States, and directly from Europe, for forty years. The community numbered about 700 in 1900, counting all ages, and some of those people were the third generation of their families to live in the area. The quilt contributors came from both the earliest settlers and more recent incomers. When we look at the relationships between many of the donors, we see a community held together with family ties. M. A. Bush March 1 – Martha Ann Stewart Bush was the ultimate early settler. Born on March 1, 1835, in Covington, Indiana, she married James William Bush in Corvallis, Oregon, in 1854. The young couple moved to the Squak Valley in 1863 and survived the night of the Indian raid in which another young couple in the valley, the Castos, were killed. Emily Darst March 26 – The daughter of Martha S. and James W. Bush, was born on March 26, 1860, in Seattle and moved to the Squak Valley as a very young girl. She, too, survived the Indian raid. At the age of 16, she married Cyrus Darst. They raised their family and lived out their lives in Issaquah. Inez Stella Darst November 11 – The granddaughter of Martha Stewart Bush, daughter of Emily Ann Bush Darst and Cyrus Darst, Inez was born on November 11, 1877, becoming the a member of the third generation of this family to live in Issaquah. Already an adult at the time the quilt was made, she would marry Marcus Gunderson the following year, when she was 28. Aunt Mattie November 3 — Martha Alice Bush was commonly called “Aunt Mattie” in the community. The youngest daughter of Martha Stewart Bush and James William Bush, she was born in Georgetown, Seattle, on November 3, 1862, and came to the Squak Valley with her parents in 1863. As was often the expected role of youngest daughters in the nineteenth century, she remained single all of her days and lived for many years as her mother’s companion. B Baxter [no date] — Bertha Wold Baxter was another of Martha and James Bush’s granddaughters. Her mother was their oldest child, Mary Samantha (usually called “Samantha”) Bush Wold Prue. Bertha was born on January 6, 1877, in Ellensburg, but her parents were both early Issaquah Pioneers, her father being Peter Wold, one of the three Wold brothers who once owned the land where the intersection of Front St. and Sunset Way is now. Peter moved his life to Kittitas County, but his marriage to Samantha ended by 1880, and she and her daughters returned to Issaquah. 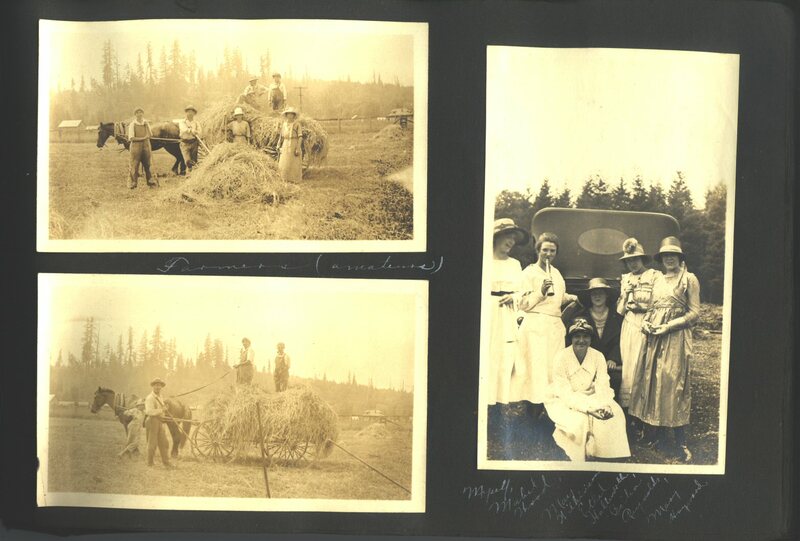 Bertha grew up spending time with her aunt Emily Darst’s family and with her grandmother Martha and Aunt Mattie, in Issaquah, as well as with her mother’s second family in Fall City. She married Charles Wesley Baxter on Christmas Day, 1902, and settled into housekeeping in Issaquah. The Baxters had two sons and a daughter, and their daughter, Beryl Baxter, would become the best known quilter in the area. For extensive information about Bertha and her family and friends, see my blog post series, “What Bertha’s Correspondence Tells Us. . .Or, I Know All the Hot Issaquah Gossip from 1902!”; this is based on a collection of letters all written to Bertha that now comprises a major portion of IHM accession #2015.10. Mary E. Burke June 24 (or 29) – Mary Ellen Hughes was born in Heckinville, Pennsylvania, in June of 1868. She married Nicholas Burke on December 25, 1890. He operated a feed store on Front Street in Issaquah (today’s restored Hailstone Feed Store was originally Burke’s warehouse). Agnes W. Hughes [no date] — may have been Mary Hughes Burke’s sister or other relative, or she may not. With no birth date for Agnes, we cannot trace whether or not they came from the same family in Pennsylvania. We have no further information about Agnes. Alice McEachern April 22, 1873 — Alice Mary Cooper was born on April 22, 1873, in Illinois, the daughter of English immigrants Isaac and Sarah Jones Cooper. By 1880 her family was living in Newcastle. On February 18, 1892, she married John McEachern, who was then the station agent at Issaquah. By 1900, her father was a saloon keeper in Issaquah. Alice M. Hackett May 8, 1878 — Alice Mary Horrocks was born on this date in England, to James Radcliffe Horrocks and Molly Greenleigh Horrocks. The family emmigrated to the United States around 1880 and settled first in Newcastle. They relocated to Issaquah by 1890. Alice married George Hackett in September of 1900, while he was Issaquah’s station agent. George was Alice Cooper McEachern’s cousin; his mother was her father’s sister. Sarah Horrocks June 27 — Sarah Horrocks was Alice Mary Horrocks Hackett’s younger sister, born in Newcastle, Washington, in 1882 (exact date uncertain, but probably June 27), after her family had immigrated from England. At that point, her father was working in the coal mines. In 1907 she would marry local banker Warren Curtis Sylvester, son of the first station agent in Issaquah and brother to Edith M. Sylvester and Ruth L. Sylvester. Edith M. Sylvester May 17, 1881 — This is her birth date. The daughter of station agent turned bank founder W.W. Sylvester, Edith would marry George Bigelow in 1910, a decade after her father and brother, Warren, started the first bank in Issaquah. Information about the Issaquah community members is drawn from legal documents available on Ancestry.com and from the general collections of the Issaquah History Museums. Ruth L. Sylvester August 6 — Ruth was born in 1878, but the records conflict as to whether she was born in April or August. She was Edith’s older sister. She may or may not have come to Issaquah when her family moved from Cleveland, Ohio, to Gilman. Her father had already been working as a “Railroad Secretary” in Cleveland, and he was the first station agent in Issaquah. The Depot, or station, was built in 1889. In 1896 Ruth’s mother died in Gilman. By 1900, the U.S. census lists Ruth, but only Ruth out of W.W.’s children, living and going to school in Beaver Dam, Wisconsin. She lived with her father’s mother , his widowed sister, and other relatives and boarders. Ruth married William Gamble in Wisconsin in 1909, but they eventually moved to Seattle. Lois Hackett January 11, 04 — Lois Hackett was born in 1887 in England, so this may be the date on which she completed her square for the quilt. Her parents were John and Sarah Hackett. They emigrated from England and were living in Gilman in 1900. Her father was an engineer and probably worked in the mines. Lois would marry John Jacob Eastlick’s first cousin, his mother’s nephew, Roy Vaughan, two years later. We do not know of a close connection between Lois Hackett’s family and that of George Hackett, Alice’s husband, but both Hackett families emigrated from England to the Newcastle-Gilman area. Ida M. Gibson October 7, 1868 — Ida McDonald Gibson was married to John Gibson, who was the pharmacist in Issaquah. This date is her birthday. Fannie Gibson October 19, 1863 June, 1904 [Willa’s wedding date] — Sarah Frances Garner Gibson, also known as Fannie, was born in Indiana on October 19, 1863. She married William E. Gibson, who became the town doctor in Issaquah. William and John Gibson were brothers, so Ida and Fannie were sisters-in-law. S.S. Gibson March 27 – Is she related to William and John Gibson’s family? We have been unable to make a positive identification, but William and John had a sister named Sophia who never married. Tracing her through census records, she appears to have lived her whole life in Pennsylvania, where the family lived in the first half of the nineteenth century. Her death record lists her birthday as April 1, 1842, but that is only four days off March 27, and birthdays are sometimes miss-recorded. The 1910 census records Sophia as the head of household in Pittsburgh, with the rest of the household consisting of three of her unmarried sisters and one of their brothers, who was also unmarried. Sophia was sixty-eight; the rest were in their forties and fifties. Lizzie McCloskey [no date] –Elizabeth McCloskey, who was born in 1878, was the daughter of Peter McCloskey Sr. He was a farmer, and he donated the land on which the original St. Joseph’s Catholic Church in Issaquah was built. She never married. She died in Issaquah in 1955. Katie McCloskey [no date] — Katherine McCloskey, Elizabeth’s younger sister, was born in 1879. She married James William Gregory, an Irishman, in 1922. They made their home in King County and raised one son. She died in 1963. S. A. Wilson November 4, 1822 — Sarah Ann McPerson Wilson was born in Missouri and came to the Squak Valley along with her husband and three of their adult children in the 1880s. Her daughter Sevilla married William Pickering, son of the one-time Washington Territory governor and Issaquah landowner and farmer. Daughter Rebecca Ann had already married George Washington Tibbetts in Missouri, and they, too, settled in Issaquah. Son Robert married in Indiana, and he and his bride joined the family in Issaquah, where they raised their daughter, Bessie. Bessie’s autobiography, published as the book, Squak Valley, provides one of the clearest pictures of life in the valley before 1900. R. A. Tibbetts August 15, 1849 — Rebecca Ann Wilson Tibbetts, Sarah Wilson’s daughter, was born on this date in Moniteau, Missouri. She married George Washington Tibbetts in Carthage, Missouri, in 1868, after he left the army, having served the North in the Civil War. About fifteen years later, the couple moved to Issaquah, where George built a hotel and store, and where they became prominent citizens. They were very active in Grand Army of the Republic affairs, and for a time they moved to Orting, where he was the Commandant of the Washington Soldiers Home for veterans. E. Polley September 15, 1904 — Elnora Polley’s birthday was September 15, 1881, but she was probably looking forward to her own wedding, which would be on that day in 1904. Her family had moved from New York to Washington when she was three, and they were living in Renton by 1887. Her intended was Frederick Solomon Tibbetts, son of George Washington Tibbetts and Rebecca Ann Wilson. By 1900, her mother was dead and she and her teenage brothers were living as a household in Gilman. Mattie Tibbetts April 19, 1883 — She was born Mattie Ray on or about this date (records conflict), in Missouri. Her family moved to Issaquah prior to 1900, and she married George Wilson Tibbets, son of Rebecca and George Washington Tibbetts, in December 1901. Mrs. Thilda Becker March 19th, 1868 — Mathilda Swanson (also known as Thilda Tuverson) was born on this date in Sweden. She and several of her siblings immigrated to the United States in the 1880s. She met fellow Swede Louis Becker on board ship, and they married two years later. By 1890 they were living in Issaquah, where they raised five children. He worked as a miner and she operated the Hotel Stockholm on what is now Andrews Street, a few doors down from Dr. and Mrs. Gibson’s house. Christina Anderson November 23, 1864 — Christina Johnson Anderson was born on this day, but records indicate that the year was 1862. She emigrated from Sweden in 1886 married Tolle Anderson two years later in Gilman. They lived on their farm on Rainier Way, where the Cybil Madeline Park is now, close to where Lucy Stevenson’s shop was located. 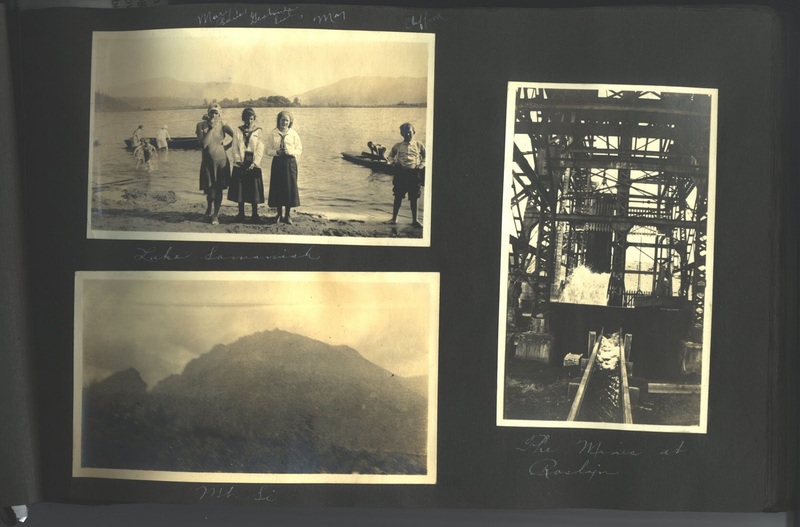 There is a brief biography of Thilda Becker in the IHM Research Center B-0000-009, which is a copy of the Hoye Becker Family Scrapbook. Willa had maintained contact with at least one family from her early days in Kansas. When she was two, the Allen family lived very near the Stevensons on the edge of Jackson in Riley County, Kansas. In the 1880 census, there are only two households enumerated between theirs on the first page of the list. 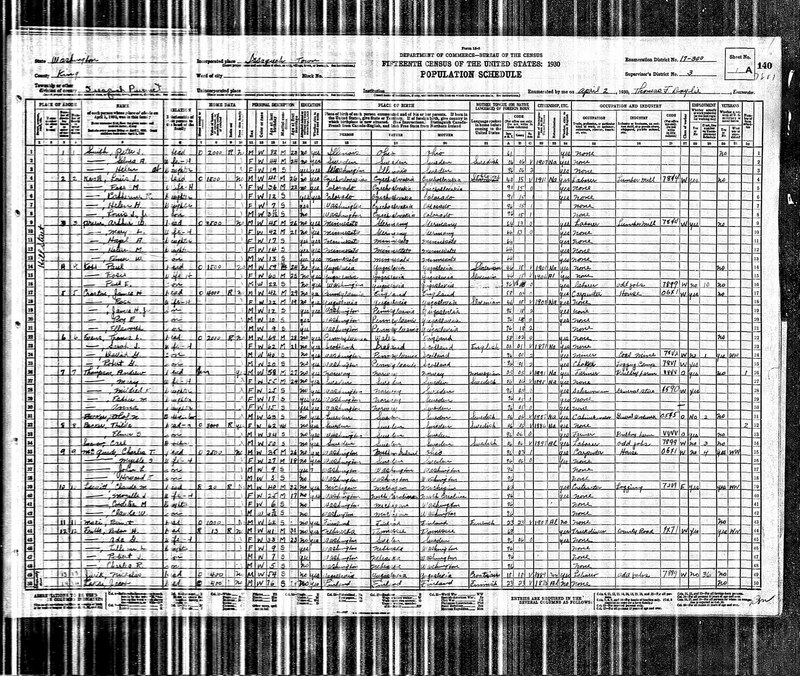 (The Stevensons have been misspelled in the indexing for that census online, appearing as “Steavens,” but the original record clearly shows James and Lucy Stevenson with their children Howard Miller and Wilhelmina Stevenson, as well as James’ brother George W. Stevenson living with them.) When the Stevensons moved to Colorado, Willa received letters from at least two of the daughters in the Allen family. The Allen family was, by this time, large and complicated. Robert Gibson Allen had married Eliza A. Daggett in 1865, and they had eight children before her death in 1883. That same year, he married Bertha Zimmerman Drollinger, a Pennsylvania native who had arrived in Kansas with her first husband after having been to Colorado, where their older daughter, Viola, was born in 1876. Della, their younger daughter was born in 1878 in Kansas. Phillip Gottlieb Drollinger died in 1880, leaving his widow with two very young daughters. They became part of the blended family when Robert and Bertha married. Robert and Bertha also had two more children together. A decade later, the bond between Willa and the Allens was still part of her life. Four of the Allen sisters sent squares for her quilt. We do not know if they sent them from Kansas, where they still lived in 1900, or from Oregon, where Mr. and Mrs. Allen had moved by 1910. 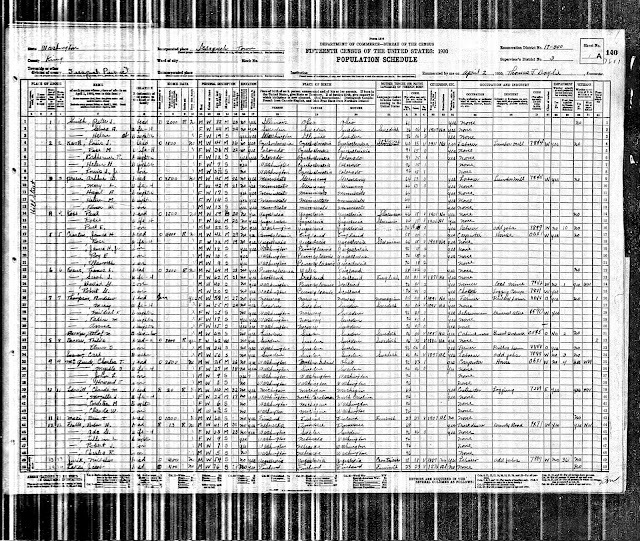 The latter census shows Ella, Sylva, and siblings Florence and their youngest brother, Andrew, living together in Suver, Polk County, Oregon. Photographs of both Ella and Florence are included with their entries in the Findagrave database online. Ella F. Allen May 23 –Ella Findley Allen’s birthday is recorded in Ancestry.com as March 24; either the date she inscribed on the quilt was not her birthday, or we are misreading something. She was born in 1882 in Garrison, Pottawatamie County, Kansas, the youngest child of Robert and his first wife, Eliza, Allen. In 1912 she would marry Frank Ackerman in Oregon. They had two daughters before she died of cancer in 1930. L. Sylvia Allen November 9, 1892 — was twelve when she contributed her square. Her full formal name appears in records as Lucille Sylvana Allen. She was the little sister “Silva” just learning to talk a decade earlier. She would marry Edmund Martin Parker in 1917, and they would live out their lives in Oregon. She died in 1980. Florence E. Allen December 18 — Florence was Silva’s older full sister, born on this day in 1888, also in Kansas. After making the move to Oregon with her parents and siblings, she married David Haman Lewis in 1911 in Polk County. They had a son, Gayle, the following year. When their marriage ended in divorce, Gayle was raised by his aunt Silva and her husband. Florence died in 1981 in Portland, Oregon. L. Allen December 9 — Luella Allen was Ella’s full sister, born on December 9, 1870, in Illinois, shortly before her family moved to Kansas. She also moved to Oregon, where she spent her adult years, and would marry William Arle Cummings. The Allen sisters have been tantalizing research subjects for several reasons. Not only do they represent the friendships formed by the Stevensons in Kansas, but they also have surnames that might or might not link them with Issaquah families represented on the quilt. Martha Stewart Bush’s mother was an Allen, and her family settled in Oregon. There are Gibson women who made squares. A day’s worth of research online, however, has turned up no solid connections between these Allens and either the other Allen family (related to the Bushes) or any Issaquah Gibsons. Mrs. ? A. Allen –Mrs. Allen may or may not have been related to the Allen sisters. 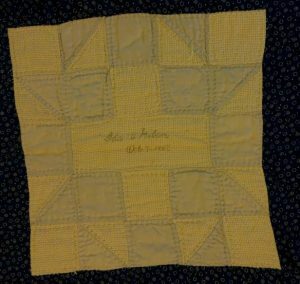 The signature on the quilt is faded to the point where we cannot read whether “A.” is her first initial or a middle one. And is “A.” her own initial, or is it her husband’s? And then there are the women of mystery. Eleven more people contributed squares. Some used their full surnames, but we have no information form women with those names. Others only put their initials on their squares, and we have been unable to identify people with those initials and birthdays. E.B.T. November 1, 1880 – This set of initials is especially frustrating because it matches the signature, on a postcard sent from Vallejo, California two years later (IHM 2016.17.248). Sent to Mrs. J.J. Eastlick, the sender acknowledged having received a letter and a post card and promised, “Will write soon. Best wishes and love, from E.B.T.” No further information is given. 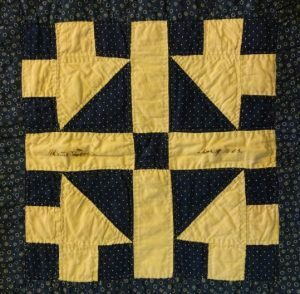 Whether we know much about some of the individuals or not, it is clear that Willa’s quilt represented a cross section of settlers, in Issaquah or Kansas. Old or young, they were connected to her life as it had been, and many would remain so as she moved forward into marriage. The Issaquah History Museums’ research center at the Gilman Town Hall has a broad range of resources about local and regional history. The David J. Horrocks Memorial Research Centerr is open to the public during museum open hours; appointments are also available Monday through Friday. We strongly recommend that researchers make an appointment to use the research center. Unless you have a research appointment, we can’t guarantee that research staff or volunteers will be available to locate materials for you. Peruse our research files and other resources available in the research center (books, videos, articles). Review photographs and documents from our collection. Access our community family tree and genealogy information for the Issaquah area. Access the some editions of the Issaquah Press, either through digitized versions or on microfilm. Museum staff members or volunteers will pull the materials you need and will help you get started. We are also available to look up information for you, but research fees may apply. You can also find information on our web site by using the search function. You’ll find other information about Issaquah through the on-line resources listed below. Can you tell me the history of my house? If your home is one of the 125 buildings inventoried by King County during their 2003 property inventory, then we can provide you with a copy of the report on your home (copying fees apply). You can also find information about your home via the King County Parcel Viewer or the Puget Sound Regional Archives. I need a copy of a relative’s obituary. There is a chance we have a copy of the obituary in our research files, but this depends on someone either donating the obituary at some point, or a staff or volunteer clipping the obituary. If we don’t have a copy, please check the Issaquah Press (either online or at the library). I need a copy of a relative’s birth certificate/death certificate. Although we may have information on births and deaths for selected people who lived in Issaquah, we do not hold any official records. Depending on the year this person was born or died, this information will be available from either King County Vital Statistics or the Washington State Department of Health. There is a house in my neighborhood that is going to be torn down. How can I save it? Unfortunately, there may be little that you can do to save a particular property if the owner plans to tear it down. Private property owners have a right to do what they like with their property. That being said, there are significant benefits to landmarking a historic building or site; community members can appeal to a property owner and help educate them about these benefits, although the ultimate decision belongs to the property owner. The King County Office of Preservation has more information on historic registration, including the benefits to a property owner and the requirements that need to be met in order for a property to be considered historic. Note that not all buildings are eligible for landmark status on the basis of age alone; uniqueness, preservation and historic value must also be considered. You can find a range of tutorials on our blog site which can help you navigate some of the resources mentioned here. Text of ordinances and council meeting minutes from 1892 to the present day, and resolutions from 1970 to the present day. (See the tutorial on our blog). Transcriptions of King County death certificates (1892 to 1947) of anyone born in Finland, or of Finnish descent. The certificates are arranged by date of death, and the transcriptions of some names may not be completely accurate. Online obituaries are available for many or most of Flintofts’ clients since 1999. Obituaries are searchable by last name. Many graves at Issaquah’s Hillside Cemetery have been recorded in this online database. Grave information for cemeteries all over the United States is also available. If you are unable to find a grave through this site, it may mean only that the grave has not been indexed yet. This free resource links visitors to immigration records from 1892 to 1924. Site users may view images of the original ship manifests, which often include information on age, occupation, hair and eye color, home town, next of kin in country of origin, and name and address of party they will be meeting in the USA. Images of the ships used for passage are also available. Castle Garden, the predecessor of Ellis Island, was our nation’s first immigration center. This free web site provides access to more than 10 million immigration records from 1830 to 1892. This web site is still being built and completed, so access to original records may be limited at this time. Issues of the Issaquah Independent (Jan. 25, 1900; Mar. 31, 1906; Dec. 28, 1907-Dec. 29, 1911) and the Issaquah Press, 1918-present, are available at the Issaquah History Museums’ research center, the Issaquah branch of the King County Library System, and through the UW Microform and Newspaper Collection, at the Suzzalo Library, University of Washington. If you would like to come to the IHM to use the microfilm reader, please schedule a research appointment in advance. A repository of historical county government records. Includes birth, death, marriage and divorce records, property records, criminal and civil court records, Records are in many formats, including paper, photographs, maps, and audio-visual materials. Located on the Bellevue Community College Campus, the archives are the best place to find a history of your home or property. You’ll need to know the tax parcel ID number before you go, and it’s best to set up a research appointment with them ahead of time. Other documents available at the PSRA include local government records from county offices such as the Auditor, the Clerk, the Treasurer, the Board of Commissioners, and from municipalities, school districts, and other service districts. The collections at Sand Point Federal Archives span 1850 to the 1990s and feature maps, architectural drawings, photographs, records, and other documents created or received by the Federal government. They also provide microfilm access to federal census records from all states and territories between 1790 and 1930, in addition to other records of genealogical interest. See their web site for more information on planning a visit. The University of Washington Special Collections include city directories, phone books, newspapers, atlases, manuscripts and personal papers. Copies of some birth and death records can be obtained through this office, or ordered online. Copies of some birth, death, marriage and divorce records can be obtained through this office, or ordered online. In celebration of National Poetry Month we’ve been posting some of our favorite poems. Located in Gilman Town Hall, our David J. Horrocks research center contains many resources including some writings from the local community. “From Vasa to Issaquah, Poems Verses and Stories” by Hilda Johanson Erickson is one of those titles. Hilda Johanson Erickson was born in Sweden in 1885. She came to America via Canada and married her fiancé (who was already living in High Point) in 1909. They built a house south of Issaquah and lived there for the remainder of their lives. She wrote many poems and stories, some of which deteriorated over time, but the ones that remained were reconstructed and put together by her grandchildren into this book. Learn more about the David J. Horrocks Research Center, and how you can use it, here. Searching for specific dates is a useful tool when researching. We recommend that you utilize Advanced Search when looking for certain dates and time periods. Although, Keyword Search and Click & Search have their place, and we will cover how to use them in searching for dates as well. 1. Click on the “Advanced Search” button on the left-hand side. Enter any non-date specific information you want to search for in the appropriate boxes. a. You can enter a specific date (see above formats) in the box labeled “Date”. This will search for that specific number in either the Date field, or the Year Range fields. It will NOT however include dates that fall into a range with numbers other than the one you typed in. For example, if you are searching with the year 1914 in the Date field, you would get records with a Year Range 1914-1918 but NOT 1913-1918, even though 1914 falls within that range. b. You can use the Year Range feature in the Advanced Search by entering in your “Start Date” and “End Date.” This will give you results with dates within that range. This is the recommended method. 3. On the right hand side, there is a box with options for narrowing your search. You can search for only records with images by clicking the button labeled “Only records with images. You can also search specific content sections in our database. If you’re not sure what you’re looking for, it’s recommended to search “All Content”. To search one or more specific sections, click the box next to the section you wish to search. 4. Click the Search button and your results will appear on the next page. To view the item record, click on the text link. To view only the image, click on the thumbnail and it will pop up into a new window as a larger image. The main page of our Digital Collections is the Keyword Search. Should you navigate away from the page, you can return to it either by clicking “Home” or “Keyword Search” from the left-hand buttons. 1. In the box on the main page, enter the date or text you are looking for. Putting quotes around the text will search for ONLY that phrase – exactly as you’ve typed it. 2. As in Advanced Search, you can limit your results to records with images only, and choose which section/s you wish to search (or search All Content). Click the Search button and your results will appear on the next page. To view the item record, click on the text link. To view only the image, click on the thumbnail and it will pop up into a new window as a larger image. Using the Click & Search is a fun way to peruse the Digital Collections. When searching for date specific information in our database, it’s a good way to see what is available within certain time periods. 2. You will see rows labeled different things, all with letters of the alphabet following them. In the row labeled “Date”, click on “#”. Find the date range you are looking for and click the link. 3. A dropdown box will appear. Click on the down arrow and make your selection. As you can see some years have a lot of specific dates, and others not as many. 4. Your search results will appear on the next page. To view the item record, click on the text link. To view only the image, click on the thumbnail and it will pop up into a new window as a larger image. There are a few ways to go about finding people in our Digital Collections. You can use Keyword Search, Advanced Search, or Click & Search. There are reasons for using each one, and I will go through them here. Using the Keyword Search is your basic catch-all search, just like an internet search engine. Simply type in what you are looking for and you’ll receive your results. The Keyword Search searches all available fields including Name, Description, Title, Collection, etc. 1. In the box on the main page, enter the name you are looking for. Putting quotes around the name will search for ONLY that phrase – exactly as you’ve typed it. This is not really recommended when searching for names, as often times maiden names, nicknames, and other spellings will be excluded from your results. 2. On the right hand side, there is a box with options for narrowing your search. You can search for only records with images by clicking the button labeled “Only records with images. 3. You can also search specific content sections in our database. If you’re not sure what you’re looking for, it’s recommended to search “All Content”. To search one or more specific sections, click the box next to the section you wish to search. Using the Click & Search is a fun way to peruse the Digital Collections. It is also helpful when finding people if you aren’t sure of the spelling of a name or have limited information. It is also fun just to browse! 2. You will see rows labeled different things, all with letters of the alphabet following them. In the row labeled “People”, select the letter of the last name of the person you are researching. 3. A dropdown box will appear. Click on the down arrow and make your selection. Using Advanced Search is helpful if you want to search specific fields for names or you have other parameters you wish to use to narrow down your results. 2. You will see different fields you search. Each of these boxes searches the database in the specific field labeled to the left. Entering a name in each box will search ONLY that field in our database for that name. As in Keyword Search you can use quotation marks to search for specific phrases. 3. Enter names and other information you wish to search by in the boxes. Choose which parameter you wish for your results to sort by clicking the radio button next to the box. 4. As in Keyword Search, you can limit your results to records with images only, and choose which section/s you wish to search (or search All Content). Click the Search button and your results will appear on the next page. To view the item record, click on the text link. To view only the image, click on the thumbnail and it will pop up into a new window as a larger image. 1. You can enter a specific date (format: YYYY/MM/DD; YYYY/MM; or YYYY) in the box labeled “Date”. This will search for that specific number in either the Date field, or the Year Range fields. It will NOT however include dates that fall into a range with numbers other than the one you typed in. For example, if you are searching with the year 1914 in the date field, you would get records with a Year Range 1914-1918 but NOT 1913-1918, even though 1914 falls within that range. 2. You can use the Year Range feature in the Advanced Search by entering in your “Start Date” and “End Date.” This will give you results with dates within that range. This is the recommended method. · Generally, women are listed by their married name. However, their maiden name is included in their full name listing (if known) and is therefore searchable using Keyword and Advanced Search. · From any page on our Digital Collections you can click the button on the left-hand side labeled “Help” for more information. 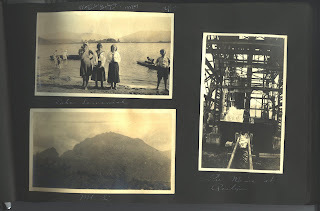 In this blog post are scans from Ruth Johns Anderson’s personal photo album. They are currently being cataloged into our database and perfectly illustrate how taking the time to label your photographs now can make a difference in years to come. The most frustrating thing for me is when am faced with a photograph with no indication of those four important things: who, what, when and where. It’s usually a wonderful photograph, in-focus with an interesting subject, stacked right in the middle of a bunch of other photographs that have been overly labeled. More interesting than trying to figure out the provenance of the picture is why someone took the time to label all the others and not this one. Where did it come from and why is it here? Here at the museum, we often run into this problem – a photo that isn’t labeled or is mislabeled. Between all of us, and sometimes the help of members, we are able to identify people fairly easily. But there are those pictures we can’t identify – and we may never be able to. The most important factor in labeling a picture is just putting a name down. First and last names if you know them. Any other information will be well appreciated. I determined everyone in a personal family album because I knew the original owner of the album and could therefore figure out who she meant by “Aunt and Uncle” and “Cousin.” And don’t forget to label yourself! These photos will not always be in your possession. Try and take the time now to fill in the other “W”s: What is going on in the picture? When was it taken? Where is the place in the picture? I can assure you this information will be well appreciated in the future. 1. Windows actually has a built in system for labeling your photos. Your digital camera should automatically embed the date taken into the picture but once you have uploaded your photos onto your computer you can then begin to add details. In Windows 7 it’s as easy as single-clicking on the picture – this will bring up a bar in the bottom of your window where you can then begin to add details such as “Date taken”, “Title”, “Tags”, and even “Rating”. The information you enter then becomes embedded into your picture file. In previous versions of Windows it’s as easy as right-clicking on the picture and selecting “Properties.” In there you’ll find fields to enter in information. I am not an Apple user but I imagine there are similar options available. 3. There are many photo sharing sites available online. I feel like this is a fine option for now – but I’m not sure how far in the future these programs will be available. But at least it’s another way to store your photos. Honestly, I feel a little shaky on the stability of digital photos. I’m not a doomsday type of person at all, but I wonder what would happen if all the technology we currently use just went away. If you’re as anxious as I am about this, your best option (although most time consuming) would be to have all the pictures you couldn’t bear to lose professionally printed. Then you could easily label the back of those and keep them safe. 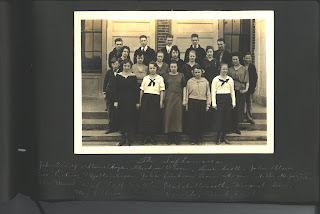 The other side of that is to digitize your heirloom photographs. In the case of a non-doomsday scenario, your best bet is to have a CD of digital copies of all your photographs (old and new) and to keep them in a waterproof, fireproof safe in your home. I would go so far as to recommend you do all of the above for photographs that you really care about. This way you ensure that your photos will remain safe. Just make sure they’re labeled! If you’d like more information on this topic as well as how to properly care for your family heirlooms, Issaquah History Museums will be offering a program on “Preserving Family Photos and Heirlooms” on Saturday, January 15, 2011 at 11am. The program is FREE to the general public. 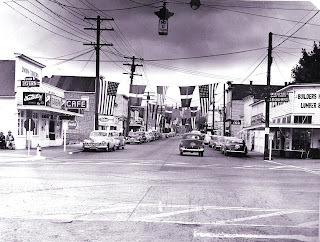 Please visit https://www.issaquahhistory.org/ and click on the link at the top of the page for more information. Most people recognize April 1 as April Fool’s Day, but for the diehard research geek (who also happens to hate practical jokes) this year’s April 1 is much more happily recognized as the reference date for the 2010 census. Census records are critically important when it comes to historical research, because they ideally provide a snapshot of the life of every American. Your census form may feel like a dull bit of paperwork until you consider the fact that this information will be available to your descendents in 72 years. This is the picture they will see of your life. Privacy laws prevent census data (other than aggregates, without any personal details) from being made public until 72 years have passed, to protect the privacy of living individuals. As the average lifespan extends, I wonder if the government will rethink the number. I rather hope not, because as excited as I am about completing my 2010 census (because, as I said, I am a diehard research geek), I am even more excited about April 1, 2012, when the 1940 census will be released. Why did the government care about whether or not you had a radio? They were trying to determine to what extent citizens were embracing the new technology. President Franklin Delano Roosevelt later applied this information in his decision to hold “fireside chats” over the radio between 1933 and 1944. April 1 has been the census reference date since 1930. All questions on the census form relate specifically to April 1, regardless of whether the form is completed before or after that date. This helps make sure the data is consistent and reduces the chance of people being counted multiple times. In spite of this, some people did get counted twice, generally if they were working away from home. If you were working as a live-in servant or at a lumber camp, for example, your employer often counted you on their own census form while your nuclear family also recorded you as a family member.